The Atlona AT-HD420 converts HDMI to a VGA or component output plus stereo audio. It enables an HDMI source to connect to a PC monitor, Projector or TV. Its high bandwidth capability supports a wide range of PC monitor and HDTV resolutions up to 1920 X 1200 or 1080p. The converter is also capable of de-embedding audio from the HDMI source and converting it to a stereo 1/8-inch interface. This will allow the user to connect it to a set of speakers, an AVR or any other audio device. Supports HDMI input and VGA or component output. 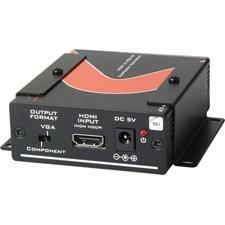 Allows user to select between VGA or component video output interface. Supports VGA VESA resolutions up to 1920x1200 or component video up to 1080p. Embedded EDID will simplify the installation procedure. The HD420 will sync up with the source and let the source know to start outputting RGB or YPrPb format depending on the output selection and switch audio to stereo or PCM. HDMI 1.3, HDCP 1.1 and DVI compliant.